Delve, Sway, Revolve: For those who don’t follow Microsoft’s products closely, the words might sound like instructions for a nerdy line dance. But like the mashup generation they’re written for, the three new apps take elements of Microsoft’s productivity generation and blend them together. The mantra of productivity is months old by this point. Microsoft’s former chief executive, Steve Ballmer, began proclaiming it, and it’s been a rallying cry for Satya Nadella, too. Frank Shaw, the company’s chief spokesman, reiterated the message in a blog post Monday, pointing out that Microsoft has adapted as its users’ work habits have begun changing, too: Desktop and mobile are blurring, and apps need to be proactive, not just reactive. Delve: in September, Microsoft said Delve will be rolled into Office 365 by January. Delve accumulates information from Lync, SharePoint, and Yammer, pulling together a snapshot of the documents you need to interact more effectively with your teams of coworkers. 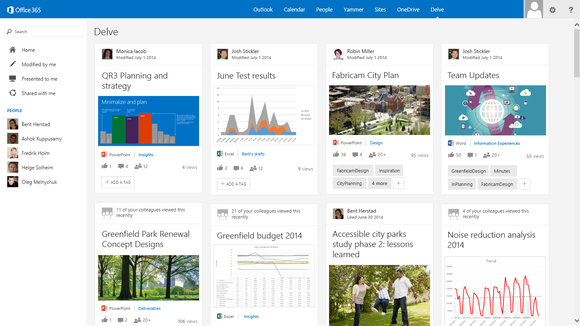 Microsoft’s Delve collates information it thinks you’ll need from colleagues. “With Delve, information finds you versus you having to find information,” Julia White, the general manager of Office, wrote at the time—one of the points that Shaw, and Microsoft, have tried to make about Microsoft’s new product portfolio. 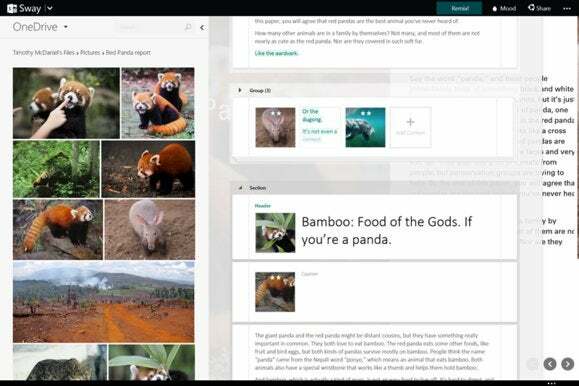 Sway: This lightweight content creation platform, which combines elements of PowerPoint and Word, is currently in preview mode. In keeping with Microsoft’s newfound belief in openness, the company is soliciting feedback from customers and users on how it should evolve. I found it intriguing, and I could see it supplanting the more formal Word for school reports. Sway allows you to mix photos and other art with text quickly and easily. For years, Office has been built upon three pillars: Word, Excel, and PowerPoint. Workers and consumers wrote letters and reports, compiled spreadsheets evaluating their financial performance, and presented the results to their coworkers and clients. OneNote now fits in as a sort of digital rough draft to organize data in preparation for more formal presentations through the other applications. And to me, that reflects the years when financial conferences meant wearing a suit and listening to some aged executive explain the company’s financial performance. Now, the Zuckerberg generation of executives supplies free gourmet meals, coffee bars, and beer bashes to a cadre of employees who text, message, and Instagram rather than call or email. And while companies like Evernote and Google attempt to engineer productivity into their own applications, Microsoft has also come down from its Office mountain to walk among the people. 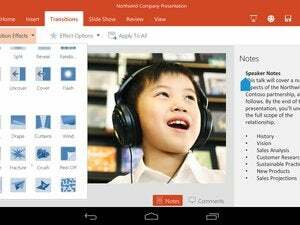 Microsoft’s simplified reworking of the Office experience within the iPhone, iPad, and Android platforms indicates this, almost more so than the company’s decision to make more of Office’s features free to use. So in these three apps—and, conceivably, more to come—we see two things: a blending of existing Microsoft technologies, and a wrapper that’s designed to allow information to be widely accessible, shareable, and connected. Microsoft’s Julie Larson-Green, head of experiences at Microsoft. What interested me most about McCracken’s report was seeing a photo of Julie Larson-Green, now the chief experience officer at Microsoft. Recall that in February, Larson-Green, who helped create the look and feel of Windows 8, was ”demoted” to oversee the look and feel of Windows and Office across all of the Microsoft’s platforms. For those who despise the look and feel of Windows 8, that was bad news. But what that photo tells me is that there’s a method to the madness, and this isn’t Microsoft throwing out apps to see what will stick. Let’s be honest: Many of you will just shrug your shoulders and keep on using Word, PowerPoint, and Excel. But there isn’t just a generational gap in how younger users think, but in how they work, too. There’s less of an emphasis on formal communication, and greater weight placed on the speed of delivery. The sum total of curated information is now more important than the source of that information—for better or for worse. Does this mean that we now can expect to see crazy hybrids of Word and SQL Server? Or Visio and Windows Media Player? Of course not. But based on what Microsoft has been talking about, this concept of “blended apps” appears to be here to stay. A decade ago, Microsoft might have measured its success by the number of copies of Office it sold. Now, a well-liked Facebook post—“Hey, apparently Sway is from Microsoft. Heh. Never knew they were actually cool”—could be enough to launch a spontaneous round of high-fives in Redmond boardrooms.